In 2004, the NYC Cultural Affairs Department and the National Endowment of the Arts conducted a high-profile international architectural competition to redesign the Queens Museum of Art. Over 200 entries were submitted and judged anonymously by a jury of prominent designers and museum/arts professionals. PDA’s precursor firm Salazar Davis Architects was chosen as one of 5 finalists, and offered a $25,000 stipend as compensation for furthering its design work. The SDA entry was admired for the bold, elegant quality of its gestures, balanced with deference to the original 1939 World’s Fair structure that to this day houses the museum (the competition-winning Eric Owen Moss entry antagonized preservationist neighbors and was never realized). The proposal seen here removed the roof of the original structure, creating an inner court accessed freely by pedestrians from the Flushing Meadows Park. The courtyard was to be a sculpture garden, also containing the remarkable 1964 World’s Fair “Panarama of New York”, a scale model of epic proportions, now – as planned – housed in an irregularly-shaped free-standing structure. The second major intervention was to have been a glowing, multi-colored glass gallery tower. 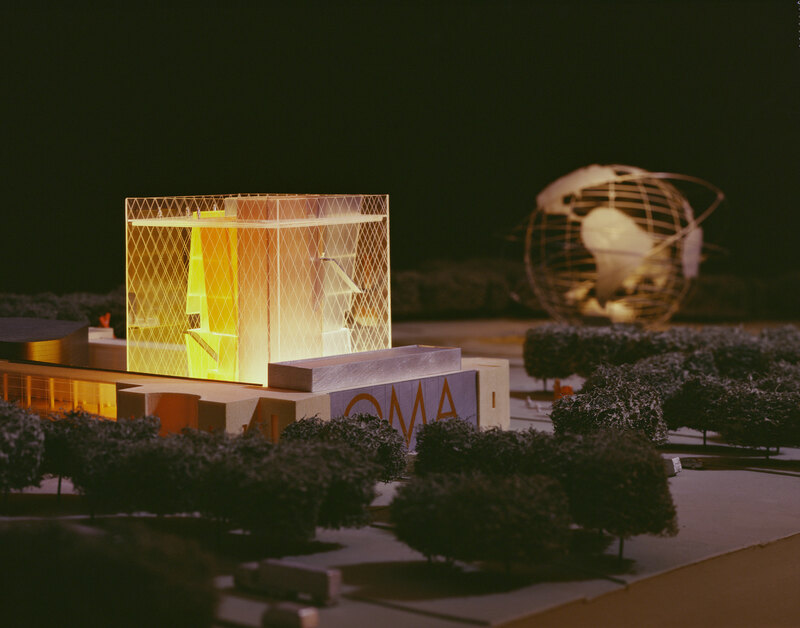 Expressed as a cluster of faceted shards in a transparent box, this destination building symbolically and physically projected the enhanced profile of the QMA as a cultural arts center within the park and the city beyond.